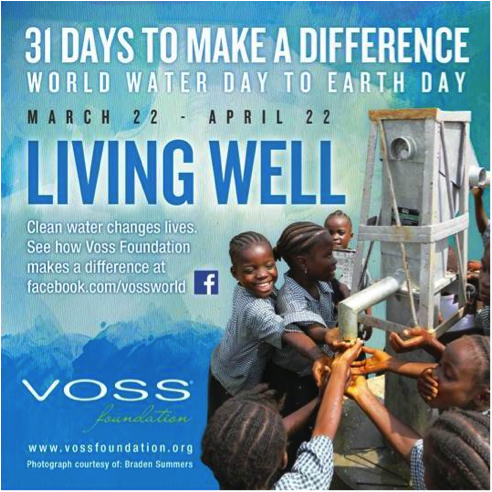 In support of the Voss Foundation’s mission to bring clean water, sanitation and hygiene to sub-Saharan Africa, Voss Water has launched a Facebook app that will share photos of a well in the process of being built every day for 31 days as part of their “31 Days to Make a Difference” campaign. The app also provides an interactive map that allows fans to learn about specific communities and the people impacted by wells that Voss Foundation has built in the past. We love that this message-focused cause campaign uses Facebook to visually show a real well being built in a specific location in Africa. It’s a simple way to bring tangible visibility to the impact this effort makes. Running a 31-day campaign also makes good sense for business: in 2013, more than 20 major supermarket chains participated in “31 Days” at point of sale. The question that goes answered, however, is what consumers can do to engage beyond learning more about water issues and what might incentivize them to return to the app to watch the well take shape. A transactional component, for example, might encourage the sale of Voss water where a specified amount could further support the cause. Or rewarding a fan’s ‘Share’ of the page might unlock a donation directly to the community being featured. What’s your impression of this effort? Effective? Weigh in with your comments below!